When you think about business opportunities in tech, it’s safe to assume the elderly aren’t the first audience that comes to mind. And yet, with the median age rising in many countries throughout the world, seniors are quickly becoming a demographic that can’t be ignored. In Singapore, the median age of the population has risen from 34 in 2000 to 39.6 in 2015 according to the Singapore Department of Statistics. The Modern Aging program works as a sort of accelerator for teams that want to tackle the needs of the elderly through tech, healthcare, and research with business potential. In September, 20 teams were selected through an idea submission process and started work at a bootcamp. The teams, many of which were formed for this purpose, met industry mentors and learned how to pitch their products to investors. Six teams emerged out of the 20, and at last night’s event, three of those teams walked away with seed investment. However, the other teams still had an opportunity to meet investors and present their work. The winners were chosen based on their idea’s value proposition, its market potential, monetization, and the team’s overall strength and entrepreneurial ability. First place was shared by Altrue and Pillpresso. The two teams received seed funding to the tune of S$50,000 (US$35,800). Altrue has created Silver Lining, a smart sensor used in adult diapers. 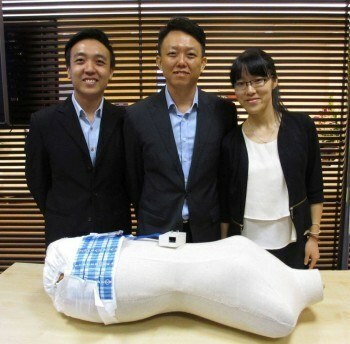 It detects when the diaper has been soiled and alerts the patient’s caregiver. The caregiver first receives a buzz on their wearable. If there’s no reaction, an SMS is sent to their phone. Finally, they or the patient’s next of kin, or even the authorities, get a call. Quick action in this regard is key to helping prevent infections. As unpleasant a thought as this might be, it’s a harsh reality for many patients who can’t take care of themselves – the team hopes this method will help improve their quality of life and restore some of their dignity in their process. The company will put the seed funding toward further research and development of the sensor, as well as marketing. It will also look to develop a version for baby diapers. Altrue aims to release Silver Lining in 2017. Pillpresso resembles a coffee machine you can find in most kitchens. But instead of sweet java, it dispenses pills. As seniors get older, the need to stick to their medication regime gets more pressing. Unfortunately, the risk of confusion increases as medication schemes grow more complex. Pillpresso’s dispenser has 10 medicine compartments. An alarm lets the patients know when it’s time to take their pills and the machine knows what pills to dispense at what time at the push of a button. Meanwhile, it talks to a mobile app that lets caregivers and relatives know that the machine has dispensed the right pills at the right times. The team, which was brought together by the program, is working on a prototype at the moment, as well as the software controlling the machine. It expects to complete development by the end of 2016. The third team, which bagged S$25,000 (US$17,900), is SoundEye. They are making a detection system that can tell when an elderly person has fallen in their home while unattended. The system doesn’t use a camera, but an array of thermal infrared and ultrasonic detectors and a microphone. This allows it to detect both falls and screams or calls for help, and alert caregivers and emergency services. It also gathers data on the elderly person’s activity, including waking and sleeping times, bathroom visits, and so on. The absence of a camera allows the person to keep a semblance of privacy. SoundEye’s tech is based on work done at the Institute of Infocomm Research (I2R), a part of Singapore’s Agency for Science, Technology, and Research (A*STAR). Pilot studies with healthcare institutes and welfare organizations showed a 90 percent accuracy rate, the team says. The winning teams will also receive incubation support from NUS Enterprise, which includes funding, mentorship, and networking. 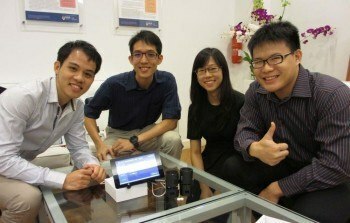 We are no longer active in These Three Teams Represent Singapore’s New Push for Tech Based Senior Care, Tech in Asia. Projects and resources are available in the archive.